Supernatural Birthday Project – And Fandom Positivity! One of the things that makes the SPNFamily so awesome is the love affair that the fans have going with the show and the characters. 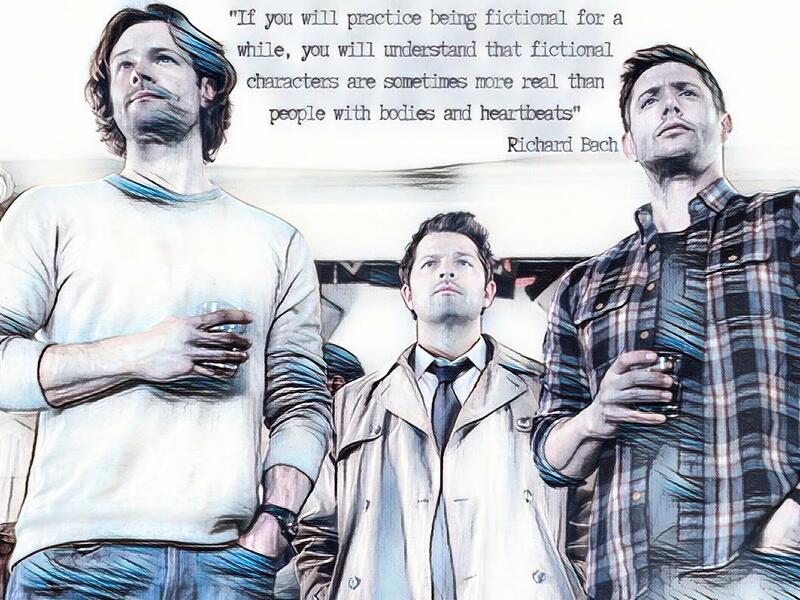 Sometimes social media can make it seem like there’s more discord and infighting than agreement or celebration in fandom, but in reality, most of us spend a lot of time appreciating our favorite characters and being grateful that they exist in the universe (even if it’s only in the fictional universe of Supernatural). There’s a fandom project going on right now that celebrates our favorite Supernatural characters, as a matter of fact. It’s called the Supernatural Birthday Project, and it runs until September 10 and is inviting all Supernatural fans to participate. The online blog goes live on September 13, and the organizers will compile a book to give to the cast at the Vancouver convention. 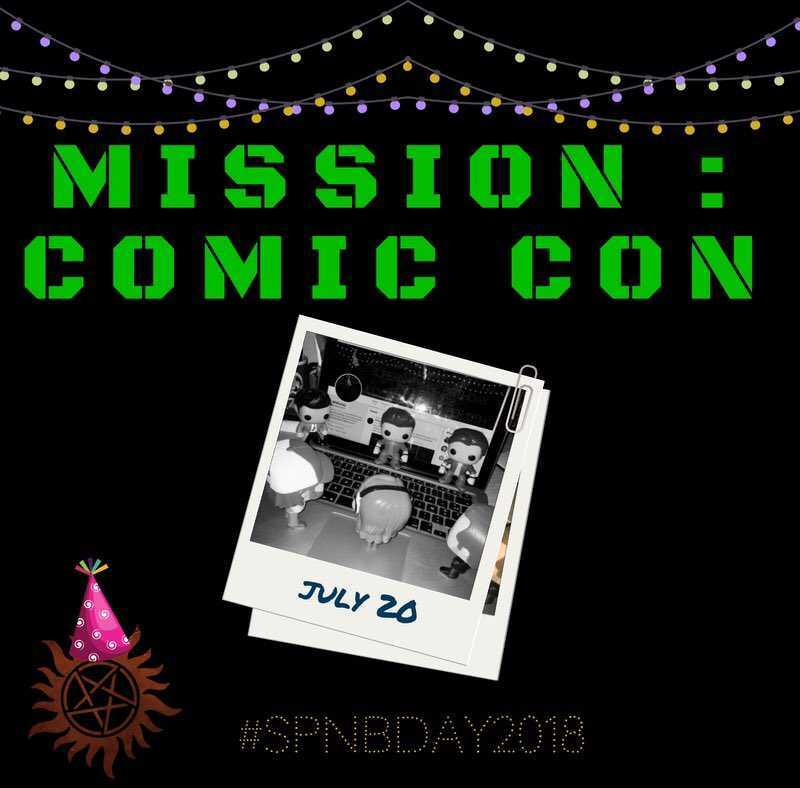 I chatted with the organizers to find out what the SPNBday project is all about. Lynn: This project, unlike many others, focuses on fans’ love for the characters instead of the actors. What was your rationale for this? Jennie twitter.com/deanisntfine: I think we were trying to get back to the core of what unites us: The love of the show itself. Everyone fell in love with the show because something in one or more of the characters spoke to them. This project gives fans a chance to look at that closely, and then, kind of cathartically, thank the characters themselves for what they’ve gotten from the show. Axy twitter.com/aaaahhhxy: We often see people creating amazing projects for the actors, either individually or as groups, but as the creator of this project, and someone who did write to Jared in the past, I questioned what it would be if I had the opportunity to speak to Sam. 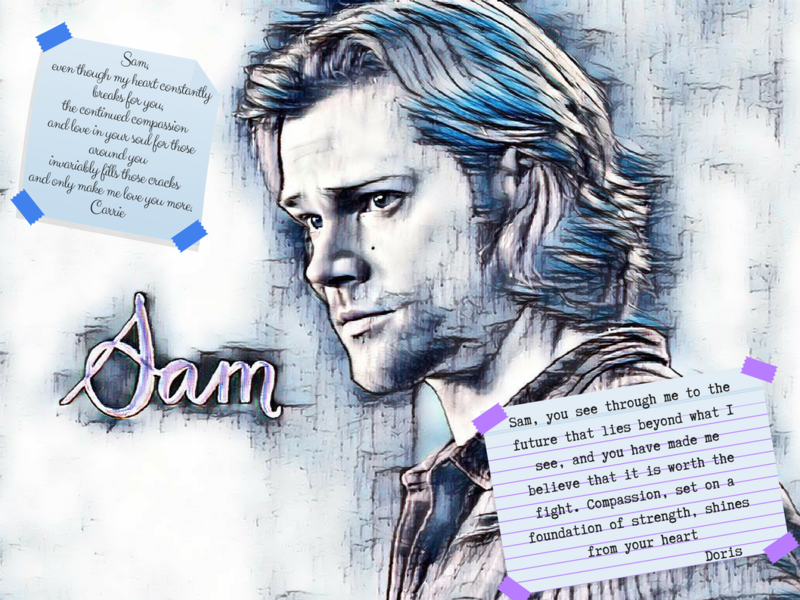 I was lucky enough to experience talking with Jared about Sam, but I felt the unexplainable frustration of knowing that I would never have this kind of conversation with Sam, and that the millions of questions I have would mostly stay unanswered, save for the more pressing ones I will be able to discuss with Jared himself. But that we can’t talk with our characters doesn’t mean that we can’t tell them things. So at first, I thought about a simple letter to Sam but then, how cool would it be to get people all over the world to do that and compile it into something that would have a different meaning for the actors because it would focus solely on their work? Those were the roots of our project. To do something original and a little different. Kathy twitter.com/MOLbunker: Most of us are not fortunate enough to know the actors personally, but many of us have come to feel like we know the characters. We have literally been to hell and back with some of them. We feel a deep connection. We’re happy when they’re happy and we hurt when they hurt. I think many of us talk to, and occasionally scream at, our televisions while watching Supernatural when we feel strong emotions we need to communicate directly to the characters. And above all else, we love the characters. We feel a connection and a bond, and we want to address that here. This show and these characters have changed people’s lives and many of us need a way to express our gratitude and love. Ellie twitter.com/hunterwholived: During the three years that I’ve been a part of this fandom, I’ve heard about a lot of people writing letters to the actors. I’ve even written one for Jared and gave it to him in May 2018, but I’ve never written one to a character from the show. I thought this would be a great way to shift people’s attention back to the show, as well as giving love to the characters and spreading positivity within the fandom, which I feel is something that has been needed recently. Mika twitter.com/samuletkeeper: The rationale I have about our project is telling through any form of media what we would say to those characters if they were real and we had a chance to talk to them one on one. Doris twitter.com/doris_helmick: The project, from its inception, has been designed to “showcase” the show and honor the characters. We all know that these roles were given life by an incredible group of exceedingly talented men and women. So gifted are the artists involved that Dean, Sam, Castiel, Mary, Jack, Gabriel, John, indeed every created character, and the universe they inhabit, has become relatable. The focus on the show’s core values; family, loyalty, trust, integrity, and hope is entwined in every episode, and has proven for so many of us to be a source of personal encouragement and inspiration. No matter how bleak the situation, how desperate the cause, how deep the loss, Sam, Dean, Cas and the extended family will keep battling “the beast”. By speaking to the character, we have a unique opportunity to show our appreciation of the actors who’ve created the characters with whom we’ve come to love, and with whom we relate. Carrie twitter.com/mokiness099: Supernatural has been on the air for so long, that a lot of fans have started to meld the actors with the characters they portray. I’ve seen people’s positive/negative feelings and expectations bleed together into both actor/characters. The opportunity this project gives us, is a way back to celebrating what first initiated the success of Supernatural: the story and the characters within it. Something compelled each of us into watching this show and kept us coming back for more. Over time, this may have become interwoven with the actors, crew, production, writers etc. but the common thread throughout will always remain the show and its characters. I truly believe that when we show our deep love for these characters, we are in fact celebrating the actors and everyone involved. We could not come to care for and connect with them so much if it wasn’t for everyone who helped bring them to life. It is merely a different way to focus that love. Taylor twitter.com/teatimeandbooks: I think the driving force behind this was to really bring it back to focus on the show. We’re all here because of this TV show and the characters in it that continually keep us coming back week after week. So it made sense for us to thank those characters, and to let them know just how much they mean to us. Gia twitter.com/Georgia_Heapyx : I believe it was to show how much the show means to us, as well as how much the cast mean to us. A lot of projects are focused on the cast themselves, so it is a nice way to bring the show back into focus. Plus, after 14 years, these characters have done so much for so many people, so this project gives people a chance to say thank you. Lynn: One of the driving forces for the project seems to be a desire to spread some positivity around the fandom (which I’m all for!) Can you say a little about why you feel this was needed? Jennie twitter.com/deanisntfine: So many fans on social media (but NOT the majority, I’m convinced) focus too much on what divides them. They have problems with a certain actor. They have problems with TPTB. They don’t want to hear about a certain ‘ship. Our no ‘shipping rule takes care of some of that. But mostly, our project lets you speak from the heart about what you //love.// There’s literally no room for negativity, because you are encouraged to speak for only yourself, and from the heart. Axy twitter.com/aaaahhhxy: Even if we are trying not to take part in it, we see the fights and wars inside of the fandom, and it hurts every single one of us when a minority is tearing us apart. Lately, the boys have been attacked for a lot of senseless things because people with agendas are looking for things to hate them for, for one reason or the other, and you can feel that even if they say otherwise, it does weigh on them. Jared and Jensen are almost entirely gone off social media, and Misha has to be a lot more defensive at times. This isn’t good. So in regards to all of this, and the fatigue it caused, we knew we needed to focus on something related to the core of the fan base…The show. That’s the second root of this project. Spreading something entirely positive. That’s what also explains how we don’t take any ‘shipping entry: It is the only way to keep away from polemics and make sure that we focus on the canon only. Kathy twitter.com/MOLbunker: Prior to, and even during this project, we have all taken note of negativity, infighting, and even hate within our fandom. Our little team, at its core, has only love for the show and all the characters, and we do not see the need for the hatred, nor do we understand it. We love our show and our fandom, and it’s very painful to watch it burn when these fights erupt. There are factions within the fandom who spread hate for certain characters, along with dangerous agendas. Not only is it sad to see, but it’s also scary. We fear for the future of the fandom and the show. We would go so far as to say we, at times, fear for the actual safety of the actors and their families. We hope that this project, geared toward the characters that we love, will bring fans together and show them that they do not need to follow the agendas of the loud hateful voices. We hope that they will see there is another way and join those of us who only feel love and gratitude for the show, its cast, crew, and characters. We want them to see that the majority of the fandom is kind and supportive and they are welcome here. Ellie twitter.com/hunterwholived: There has been a lot of negativity and hate which has divided the fandom recently. We created this project because we wanted to give people something positive to focus on, whilst showing the cast and the writers how much we love the show as a whole and the work they’re putting into it. The show as a whole was the primary reason why people joined this fandom, so we are hoping to shift the attention back to it, while spreading some much needed positivity. Mika twitter.com/samuletkeeper : The reason why feel this project is needed is that there has been an increase of negativity towards the cast and the characters they play and this project is a way to – by saying how much those characters mean to us – tell the cast how much we appreciate the work they do and how much we love them for playing those characters that became an important part of our lives. Doris twitter.com/doris_helmick: My introduction to the fandom, and to Twitter, occurred at about the same time. I blindly stumbled around a variety of fan sites, frequently left speechless by the vitriol being exchanged between specific sects, wholly devoted to promoting their POV and their POV *only*. I nearly chucked it all after being aggressively attacked for expressing an opposing opinion. But, the very heart of this fandom is focused on inclusion, family, and acceptance and I found myself beginning to feel like a cherished member of an extended family. It is that heart, the very core of the fandom, an outgrowth of the show and its core values, that should be featured and honored. This is the soul of the project: overcoming negativity with a positive light. Carrie twitter.com/mokiness099 : Social Media, while fantastic, also has some very negative aspects to it. It’s too easy for people to “speak” without thinking of the consequences of what they’ve said and how it can then ripple throughout the fandom. Unfortunately, negativity doesn’t just ripple, it rips and tears and manifests itself in many horrible ways. Now we can’t directly change or fight that per se, but what we can do is provide an alternative. A creative project for anyone in the fandom who wishes to partake in the fun. It is a way to remain connected to the SM fandom but in a fun, safe and positive manner. Hopefully it will carry the message forward that the favorable aspects of this fandom can greatly outweigh the negative if we try. Taylor twitter.com/teatimeandbooks: After some particularly trying times within the fandom, we felt it was time that we celebrated all that is loved and good about the show. This project gets rid of all the stuff that’s gone on outside of the show, with the actors and writers and fans, and is purely about the characters of the show. We all came together because of the love we had for Supernatural and it’s an amazing feeling when you yourself as well as other, dig deep to find out why that bond is so strong. Gia twitter.com/Georgia_Heapyx : Recently, we’ve noticed a lot of negativity in the fandom. Whilst we are trying not to get too involved in it, we want to do our part to make the fandom a more positive and friendly place for everyone. Jennie twitter.com/deanisntfine: Absolutely. We are all word people, but we don’t just want words. We don’t just want letters. We can’t put videos in a book, obviously, but we are looking for art, manips, poetry… anything that encapsulates your love for a character or characters, and how they’ve impacted you. Axy twitter.com/aaaahhhxy : Absolutely! We have amazing creativity and artists in this fandom, more than any other one, and we wanted to shine a light on how amazing those people are and to celebrate their many talents. So far, we have had extraordinary entries, and it is just stunning how the love for a show can spark the creativity to create actual masterpieces. Kathy twitter.com/MOLbunker : This fandom is bursting with the most amazing talent! Before I found the SPN Family on Twitter, I had never seen anything like it. We are so fortunate to have artists in abundance and diversity. The pieces they create, whether it be paintings, drawings, cartoons, or sculptures, are stunning. We also have a tremendous number of talented writers within the fandom with writing styles that are varied as the fans themselves. We hope this project holds something for everyone and will inspire widespread participation. Fan challenges associated with the project will crop up periodically on social media, with prizes awarded. During San Diego ComiCon, for example, followers of the project were asked to submit pictures of their collections of fan merch, with the winner taking home a Hot Topic “Supernatural” Book of Monsters necklace. Entries in those challenges will also appear in the book. Ellie twitter.com/hunterwholived: Yes, this project gives people the freedom to be creative in whatever way they’d prefer. People can write letters, create digital edits, paintings or even poems addressed to their favorite characters. They can be for any character, whether it’s someone of Team Free Will, an angel, a demon, or another minor character. Whoever you have felt a strong connection with, but I must stress that whatever you create must be aimed towards the character directly, as if they are sitting in front of you and you are talking to them. Mika twitter.com/samuletkeeper : Yes. Our project is also a way to show and celebrate the talent and creativity the fans have to show how they love the characters. Doris twitter.com/doris_helmick : Without question, the most gifted and talented artists are to be found within the SPN fandom. Fans express themselves through craft works, literature, painting, photography, music, and a vast array of other endeavors. Participants in this project have been encouraged to submit whatever they’ve created that spotlights the characters and the show. Carrie twitter.com/mokiness099 : This project is meant to support creativity in any form that appeals to you. I don’t feel very artistic, but what I love is that it’s not just for fans who have recognizable talent. It’s for anyone who just wants to share a part of themselves with these characters we love. This project’s aim to be inclusive has allowed me to overcome my fear of judgement to put forth some effort into finding a unique way to create something (no matter how good or bad) that comes from my heart and shares my joy of this show and its incomparable characters. My hope is that others will find the same courage and join in the fun. Taylor twitter.com/teatimeandbooks : Absolutely! We want to celebrate every form of creativity people want to use to express themselves. Letters, poems, edits, fan art, anything and everything is welcome here. Gia twitter.com/Georgia_Heapyx : Definitely! We want to celebrate everyone’s individual talents, whether that’s writing, drawing or even crafts! This fandom has lots of talented and creative members, and we want to showcase that talent! Lynn: Whose idea was the project and what is the personal motivation behind it? Jennie twitter.com/deanisntfine: I will happily let Axy speak about this. Axy twitter.com/aaaahhhxy : I am behind the initial idea, but it became a group project extremely quickly. I have met some of my closest friends in the SPN Family, and we are always supportive of each other’s ideas and projects. So when I had this character-related sort of urge, I shared it with them all and they were enthusiastic and excited about it, so it went from a rough idea to an actual project within a day or two. As for my personal motivation, it is coming from that frustration of not being able to chat with the characters themselves. Not only Sam, but Dean, Cas, Jack…And most of them. RPG can fix part of this feeling, but it remains fictional. I have had that mental pep talk with so many of them so many times, so it is exciting to be able to make something more tangible out of it. Kathy twitter.com/MOLbunker : The project is the brainchild of Axy. She recruited us with the idea of creating something completely positive during a time when there was some frightening negativity and fighting. It was an instant yes from me. What motivated me was the overwhelming need to bring something positive to the fandom and the show. The negativity is not for me and is not what I strive to be a part of within the fandom. I avoid it at all costs, in fact. This project and our team are of one mind on this. We are a tightknit group of kind and caring people from all over the world. We want to spread as much positivity as we can with this project and bring more fans together for the good of us all. Ellie twitter.com/hunterwholived: This project was Axy’s idea. I instantly fell in love with it when she approached me about it, because I adored the idea of showing how much we love the show and its characters as a whole. I hope that this project will bring people together as well as showing a more positive side of the fandom. Doris twitter.com/doris_helmick : This project began as a seed in Axy’s very fertile imagination, spurred on by her desire to change the discord of negativity into a symphony of love via a positive focus on the show and the characters who brought it to life. Carrie twitter.com/mokiness099 : Axy was the mastermind that got us all going. It was her brainstorm brought into being after discussions about fandom negativity and a way to combat it. Within our group of friends, we had all been trying to stay away from the negativity and to just be positive and supportive of each other. Axy was the one who took that initial leap forward into trying to combat the negativity with something positive instead. To not just ignore the negative and be positive with each other, but to project that positivity onto a wider scale and into something tangible. To provide an outlet of positivity to others in the fandom who had been feeling the same as us. Taylor twitter.com/teatimeandbooks : Axy came to us after a particularly rough time within the fandom. She wanted to create something that would spread happiness and positivity within the fandom. It very quickly turned into a group project and has helped solidify our friendship and has let us know where we want to stand in the fandom, we’re hoping it does the same for others too. Lynn: I have my own ideas, many of which I’ve written about in Family Don’t End With Blood, but what do you think makes the characters of Supernatural, and the show itself, so special to so many people? Jennie twitter.com/deanisntfine: It’s alchemy, isn’t it? I mean, it’s so hard to define, explain, categorize, because it’s nothing like anything I’ve ever experienced. Witchcraft? It starts with beautiful boys, who turn out to be so deep and layered that you can’t stop watching their exploits, and then you start to see something of you in them, and they become family. There’s no other way to describe it. They make magic, and they are our family. Axy twitter.com/aaaahhhxy : As a fan of many other shows, I have always felt like Supernatural was in a league of its own. For several reasons, but first, because the bond between the actors makes the bond between the characters as real as can be. Underneath the appearance of a simple, pretty-boys-chasing-monsters concept, this is one of the most intelligent and mature shows currently on television. 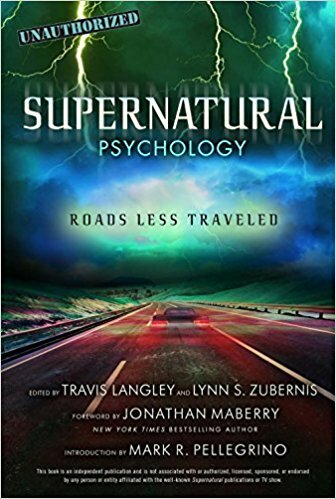 It deals with so many tough subjects, and those subjects are often at the core of our own personal worries and obsessions, how to give our existence a meaning and how to recover from our own shortcomings, and so on…Supernatural doesn’t shy away from being extremely serious while being very silly and light at the same time. The characters are beautifully built, and their evolution is constant and fascinating to look at. On a personal level, Sam helped me getting better when I fell ill last year and his struggles helped me figure out my own. It isn’t much of a stretch to say that he saved me in more ways that I can fathom, and that I wouldn’t be who I am today if it wasn’t for him, had I survived at all. There is a magic in Supernatural, something that can only be explained by how the stars aligned themselves when they cast Jared and Jensen. This show is something unique that never happened before and will never happen again, and I feel like it is our responsibility to protect it and to give back. Kathy twitter.com/MOLbunker : For me, the show is almost indescribable. It’s unbelievably believable. Other shows have done demons and monsters, but somehow this show makes them convincing somehow. And not just monsters. Angels, heaven, all of it just seems like it could be, well, real. The characters are authentic as well. Maybe too much so at times. My fellow “Dean girls” and I currently fluctuate between a state of panic and mourning as we await the outcome of this Michael adventure. We have connected with these characters in a visceral way. Many of us can see some of the personality traits of some of these characters in ourselves. We relate to them, deeply. Ellie twitter.com/hunterwholived: I have been a part of many fandoms in the past, and I have loved a lot of different fictional characters, but I am yet to find a TV show and a group of characters that have impacted me in the way Supernatural has. I think the show and the characters are special to fans because people are able to relate to them on a much larger scale. It is difficult to describe exactly why we love these characters, but watching them grow up and fight, even when the odds are against them, is inspiring to many people. There are important messages through the show, such as “Family don’t end with blood.” The characters are also well written and there has been a lot of character development throughout the show, showing a human side to some of the characters, regardless of what kind of species they are. I feel like this is one of the reasons why people love this show, as they are able to see aspects of themselves in the characters. This is what makes us feel like we truly know these characters, like we would know a friend or family member. They make us feel at home every time we watch the show. Mika twitter.com/samuletkeeper : SPN is more than just a show and the characters became an important part of many people’s lives. Through the show and its characters, many people found a family that welcomed them without judgements, many lives were literally saved, many people found their voices, their places in the world and discovered themselves. This is something special we have with SPN and it should be celebrated. Doris twitter.com/doris_helmick: Relatability connects us to the characters in an inextricably profound manner. For me, lost in grief and loss, the closeness of the family, both those bound by blood, and those found and added along the way, offered me a sense of inclusion. Never giving up; always accepting the burden of responsibility; doing the hard things, because it’s “the right thing to do”; owning the consequences of personal choices; and proving that love matters are all attributes of the Hunter Code of Honor. Dean will sacrifice himself for his family and the greater good, without hesitation; Sam feels everyone’s pain and gives back more than he has in reserve; Castiel has tasted freedom and found it to surpass everything he’d experienced as a warrior of Heaven, even though it cost him everything. They inspire me to be better, to try harder, to laugh longer, and love harder. Carrie twitter.com/mokiness099 : Most of us seem to have connected to the show almost immediately in a very visceral way. We may have come for tales of the supernatural, but we were given so much more. We were given the amazing gift of chemistry. What initially kept me coming back was the fascinating tale of these two brothers’ and their life. Portrayed by two men with as much charisma and chemistry together as the brothers. This was marvelous and unique, but then it managed to continue into the magical addition of all their friends, allies and foes. The back drop of all these relationships within a Supernatural world was and still is, the most compelling television I’d ever watched. Taylor twitter.com/teatimeandbooks : Supernatural has this amazing quality of bringing people together, and I personally think it’s down to the characters we see portrayed in that world. We see ourselves in them, we see our own struggles in theirs and it makes us feel a little less alone. It gives us the ability to find our people and family within the fandom that help us feel truly whole, much like Sam and Dean do for each other. Gia twitter.com/Georgia_Heapyx “ I think the reason it’s so special to people is because it has helped a lot of people through difficult times in their lives. Also, the characters are very relatable, which helps to make the show more personal for viewers, as they feel they have a connection to the character or characters. Lynn: If there’s anything else you feel it’s important to say, feel free! Jennie twitter.com/deanisntfine: We are a team of people from all over the world, ranging in age from teens to late 60s. In that spirit, I want to stress that //every fan// can take part in this project. All you have to do is find your voice, and then share it. Metatron said, “Write for an audience of one, you.” Well, it’s absolutely true here. The only thing you have to do is speak from the heart. Axy twitter.com/aaaahhhxy : And if I had to add something, I would probably talk about how extremely hard it is to focus on the characters to send them a message and how the experience is good for the book, but also good for our own bond to the characters as it forces us to reflect on it and to understand it differently. It is complicated and even scary at times to explore the link you have with them, but ultimately, it is grounds for growth and better understanding of what makes the show so special for people. Kathy twitter.com/MOLbunker : In closing, I will say this… This project is for everyone! Fans should send their art and their words. As they work on this project, they should please consider what we have been gifted with over the past 13 years (and counting). This show and these characters have changed our lives. It’s important that we keep positive and spread our love for the show and characters in order to show our appreciation for what they have given to us. 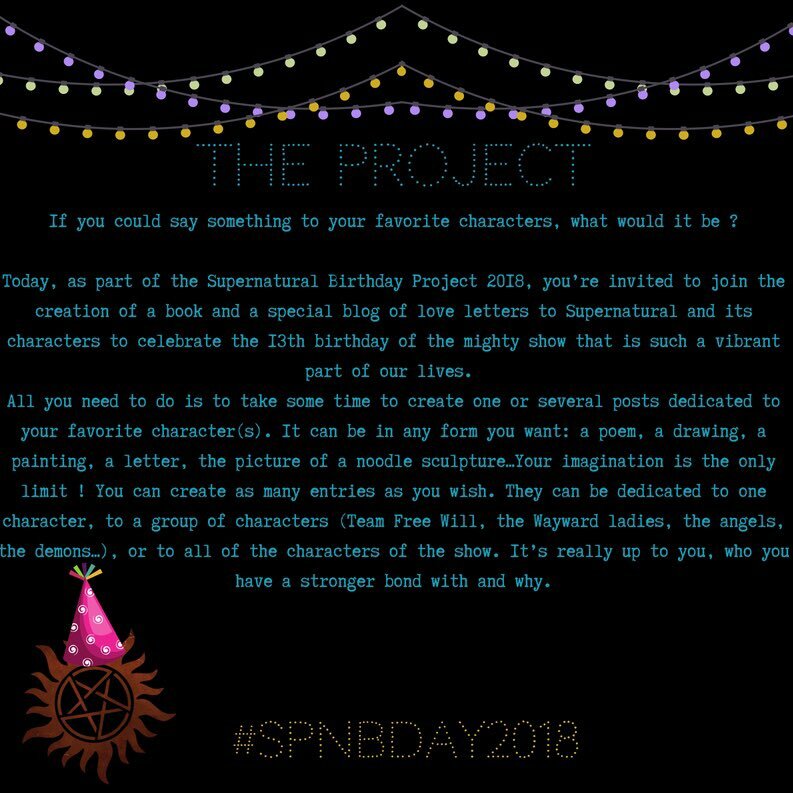 If you’d like to participate in the Supernatural Birthday project, you can send entries to spnbdayproject2018@gmail.com by Sept. 10. Which character inspires you?? ← Back To Where It All Began – Supernatural Chicago Con 2018! It’s sad that we need to prompt positivity in fandom but this is still a lovely idea. If I have time I’ll definitely contribute something! Nice to see something focusing on the show again. I miss those discussions of why Dean always charges in and Sam tries to use logic. We also try to fill in some of the missing information during the commercial breaks of time jumps. I hope they get a lot of response and maybe they can share a little bit of the love once the project it done. So excited for this project, Lynn!